This weekend the North American Aerospace Defense Command (NORAD) celebrates its 60th anniversary. On May 12, 1958, Canada and the US officially signed their most significant bilateral military accord. The Cold War agreement was supposed to defend the two countries from an invasion by Soviet bombers coming from the north. But, the Berlin Wall fell three decades ago and NORAD continues. In fact, the agreement was renewed indefinitely in 2006. Initially NORAD focused on radar and fighter jets. As technologies advanced, the Command took up intercontinental ballistic missiles, cruise missiles and space-based satellites. Thousands of Canadian military personnel support NORAD’s operations. One hundred and fifty Canadians are stationed at NORAD’s central collection and coordination facility near Colorado Springs, Colorado. Hundreds more work at regional NORAD outposts across the US and Canada and many pilots are devoted to the Command. A Royal Canadian Air Force (RCAF) general is deputy commander of NORAD and its commander-in-chief is a US Air Force general. While the Canadian Forces frame the alliance as an exclusively military matter, NORAD’s political implications are vast. The accord impinges on Canadian sovereignty, influences weapons procurement and ties Canada to US belligerence. Under the accord the Colorado-based commander of NORAD could deploy Canadian fighter jets based in this country without any express Canadian endorsement. NORAD also deepened the US military footprint in Canada. As part of the accord, the US set up the Distant Early Warning (DEW) line across the Arctic in the late 1950s. 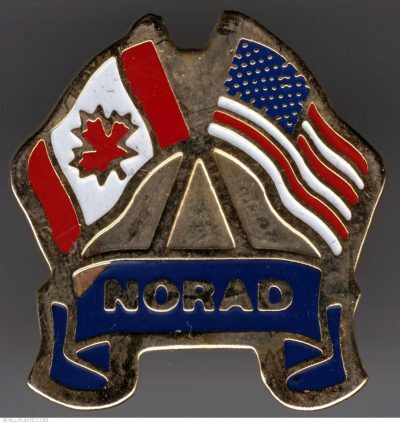 NORAD also drove Ottawa to formally accept US Bomarc missiles in 1963. According to Crosby, the agreement that laid the basis for NORAD effectively – unbeknownst to Prime Minister Diefenbaker – committed Canada to acquiring US nuclear weapons for air defence. NORAD is presented as a defensive arrangement, but that can’t be taken seriously when its lead actor has 1,000 international bases and special forces deployed in 149 countries. Rather than protect Canada and the US, NORAD supports violent missions led by other US commands. In 1965 NORAD’s mandate was expanded to include surveillance and assessment sharing for US commands stationed worldwide (United States European Command, United States Pacific Command, United States Africa Command, etc.). NORAD has drawn Canada into US belligerence. During the July 1958 US invasion of Lebanon NORAD was placed on “increased readiness” while US troops checked secular Arab nationalism after Iraqis toppled a Western-backed King (at the same time British troops invaded Jordan to prop up the monarchy there). In a higher profile incident, Canadian NORAD personnel were put on high alert when the US illegally blockaded Cuba in October 1962. This transpired even though Prime Minister Diefenbaker hesitated in supporting US actions during the Cuban Missile Crisis. During the 1973 Ramadan/Yom Kippur/Arab–Israeli War NORAD was placed on heightened alert. Washington wanted to deter the USSR from intervening on Egypt’s behalf. NORAD systems offered surveillance and communications support to the 1991 war on Iraq. They also supported the 2003 invasion of Iraq. The same can be said for US bombing in Afghanistan, Libya, Somalia, etc. As NORAD turns 60, it’s time to rekindle opposition to this odious accord.